To the left is the most comprehensive catalogue of equipment manufactured or offered by Cosmic that I have ever seen, it really was a comprehensive selection of items in the mid 1960’s. 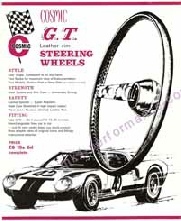 Advertising flier for their range of steering wheels. 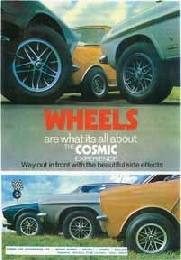 The complete Cosmic road wheel catalogue from 1972. Thanks to Jan Wulf for scanning the file and sending me it. 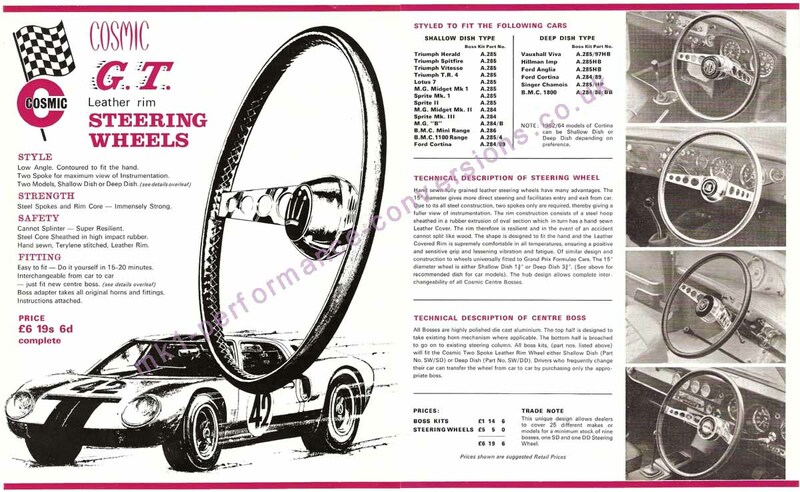 Visit Jan’s excellent MINI WHEEL REFERENCE SITE. 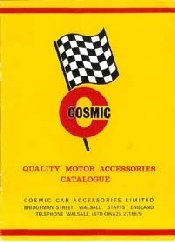 Cosmic were one of the most influential accessory manufacturers of the 1960's. Situated a tthe heart of the British motor industry, in Walsall, Staffordshire Cosmic could call on a wide range of engineering experience to make theur equipment amongst the best on offer. They not only offered a superbly engineered range of accessories but were the first company supplying the public to offer a range of alloy wheels suitable for all Minis. The Cosmic MK1 or RW10S as they called it was very popular with the likes of Radford and was seen on many very special coach built Minis sold to the likes of The Beatles, The Aga Khan & Lord Snowden.